Prof. Mario Valentino obtained his Ph.D in 2001 with distinction through a scholarship awarded by the Max Planck Institute for Neurological Research,Cologne,Germany following a brief training period as Research Guest Fellow. His study involved the investigation of the haemodynamic and molecular mechanisms of ischemic brain damage caused by strokes. Subsequently, he was awarded a 3-year post-doctoral fellowship in the Dept. of Neurology, Washington University, St.Louis. MO and the Hope Center For Neurological Disorders, St.Louis, MO, USA to study the neurobiology of white matter damage in the context of ischemia and hypoglycemia using advanced imaging techniques. 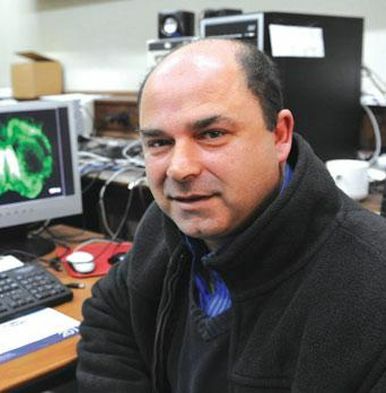 In Malta, he has established the Laboratory for the Study of Neurological disorders at the University of Malta that is centred around the study of mechanisms of injury and recovery after Stroke with special emphasis towards optical in vivo imaging and electrophysiology. He is currently an active member of The Society of Neuroscience, International Brain Research Organization and the New York Academy of Science. Prof. Valentino serves as ad hoc reviewer for the editorial boards of the journals: Stroke, J of Neuroscience Methods, Journal of Visualized experiments, Glia, Neuroscience, Neuroscience Research, CNS Neuroscience and Therapeutics, Future Neurology and Journal of Cerebral Blood Flow and Metabolism and supervised several student doctoral and masters projects in his field. He has published extensively in high impact journals and book chapters and was recently asked to serve as a reviewer for the World Stroke Conference for the term 2015-2018. He is also associate editor to the journal Xjenza and editorial board member to the American Journal of Biomedical Research, International J Biological Studies and CNS Neuroscience and Therapeutics. Research in his laboratory is directed to understanding cellular mechanisms of damage and the pharmacological recovery in stroke. Many neurological conditions are caused by damage to neurons and gliai cells following traumatic, anoxic, infectious and immunological damage. For most of these diseases there are at present no effective treatments to minimize the extent of damage, and no effective way of replacing what has been lost. His current research mainly focuses on hypoxic-ischemic (HI) injury of the cellular constituents of the brain’s white matter (WM). He has shown that vulnerability of WM to ischemia varies during development and more recently that central axons preparing to myelinate are highly sensitive to HI and that axon metabolism resolves around astrocytic lactate. There is growing recognition that approaches to reducing injury must also protect the ‘neurovascular unit’. The dynamic events can at present be followed by high resolution imaging using multiphoton microscopy that enables teh researchers to capture cellular and molecular events deep down within brain structures. Knowledge of the intricate dynamics and cross-talk between neurons, glia and the vasculature is unraveling what causes these cells to die and how they could be made to recover. A better understanding of these ‘death cascades’ is critical in the testing of drugs. One significant reason for these advances has been the development of fluorescent proteins that can be incorporated into proteins by genetic fusion to produce a fluorescent label in transgenic mice. Additional projects have identified that the time-dependent damage of astrocytes differs between different brain regions, and that different subclasses of astrocytes also exist within the same brain region exhibiting differential vulnerabilities to injury. Since neuronal death is seen as a consequence of the failure of astrocytes to support the metabolic demand of neurons, efforts designed to protect the astrocytes may constitute an alternative strategy for neuroprotection. Experimental methods used in the lab include in vivo stroke models, optical imaging techniques, brain slice preparations, intravital two-photon imaging, electrophysiology and immunocytochemistry. The laboratory benefits from the collaborative environment provided by several international collaborators including the Max Planck Institute in Cologne, Universities of Plymouth and Heidelberg. Schiavone S, Mhillaj E, Neri M, Morgese MG, Tucci P, Bove M, Valentino M, Di Giovanni G, Pomara C, Turillazzi E, Trabace L, Cuomo V. (2016) Early Loss of Blood-Brain Integrity NOX2 Elevation in teh Prefrontal Cortex of an Animal Model of Psychosis. Mol.Neurobiology; DOI 10.1007/s12035-016-9791-8. Casarrubea, M. Davies, C., Faulisi, F., Pierucci, M., Colangeli, R., Partridge, L., Chambers, S., Cassar, D., Valentino, M., Muscat, R., Benigno, A., Crescimanno, G., Di Giovanni, G. (2015) Acute nicotine induces anxiety and disrupts temporal pattern organization of rat exploratory behavior in hole-board: A potential role for the lateral habenula. Frontiers in Cellular Neuroscience, Vol 9, 1-17. Marino Gammazza, A., Colangeli, R., Orban, G., Pierucci, M., Di Gennaro, G., Lo Bello, M., D’Aniello, A., Bucchieri, F., Pomara, C., Valentino, M., Muscat, R., Benigno, A., Zummo, G., de Macario, E. C., Cappello, F., Di Giovanni, G., Macario, A.J.L. (2015) Hsp60 response in experimental and human temporal lobe epilepsy. Scientific Reports 5: 9434, DOI: 10.1038/srep09434. Vella J, Zammit C, DiGiovanni G, Muscat R and Valentino M (2015) The central role of Aquaporins in the Pathophysiology of Ischemic Stroke. Frontiers in Cellular Neuroscience. http://dx.doi.org/10.3389/fncel.2015.00108. Zammit, C., Muscat, R., Sani, G., Valentino, M. (2015) Cerebral White Matter Injury following a Hypoxic/Ischemic Insult during the Perinatal Period: Pathophysiology, Prognostic Factors, and Future Strategy of Treatment Approach (2015). Current Pharmaceutical Design. DOI:10.2174/1381612821666150105122008. Mifsud G, Zammit C, Muscat R, Di Giovanni G and Valentino M. (2014) Oligodendrocyte pathophysiology and treatment strategies in cerebral ischemia. CNS Neurosci Ther;20(7):603-12. Brunetti, O., Imbrici, P., Botti, F. M., Pettorossi, V. E., D’Adamo, M. C., Valentino, M., Zammit, C., Mora, M., Gibertini, S., Di Giovanni, G., Muscat, R., Pessiaa, M. (2012) Dysfunction of voltage-gated K+ Channels Kv1.1 in sciatic nerve causes spontaneous and stress- induced neuromuscular hyperexcitability. Neurobiology of Disease, 47, 310-321. Alix, J. J. P., Zammit, C., Riddle, A., Meshul, C. K., Back, S. A., Valentino, M., Fern, R. (2012) Central axons preparing for myelination are highly sensitivity to ischemic injury due to the transient expression of Ca2+ channels. Ann. Neurology 72:936–951. Pierucci M, Galati S, Valentino M, Di Matteo V, Benigno A, Pitruzzella A, Muscat R and Di Giovanni G (2011) Nitric Oxide modulation of the basal ganglia circuitry: Therapeutic implication for parkinson’s disease and other motor disorders. CNS & Neurological Disorders. Drug Targets, 10 (7):777-79.